A premium olive oil is a fundamental foundation for Italian style cooking. There are a number of advantages of oil due to its versatility as an ingredient and there are a number of different types of olive oil from extra virgin to light in colour. Napolina's range covers all your cooking needs and to make it easy for you we've introduced colour-coded labels and easy-to-follow flavour descriptors on our bottles. Olive oil is extremely versatile and perfect for everyday use including frying and marinating meat, fish and vegetables. Extra virgin olive oil can be used as a base for sauces, dips and dressings and for drizzling over salads, pasta and cooked meats for additional flavour. 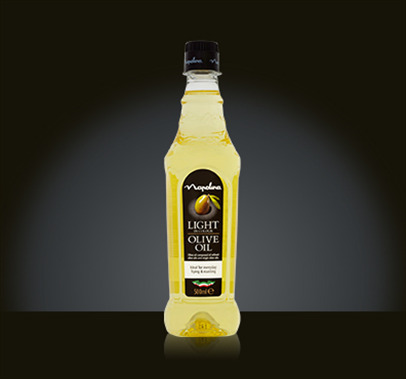 Light in colour olive oil retains food’s delicate flavour and can be used for frying both sweet and savoury foods. It is ideal for everyday frying and roasting. Our special selection extra virgin olive oil has been expertly blended to give your dishes an added touch of flavour. Lightly peppery in taste, this oil is perfect for drizzling over salads or fish, or used as a base to add your own Mediterranean touch. This range of Olive Oil, Extra Virgin Olive Oil and Light in Colour Olive Oil is perfect for convenient quick cooking as well as managing portion control and can be used in a number of key ways.